Mother Nature is about constants. The speed of light, conservation of energy, gravity, these are all constants of Nature. Change is a constant of Nature! Some of these, the speed of light for example, are constant in value. Others are constant because they apply anywhere in the Universe in accordance with laws of physics for example. Change is a constant because it is the permanent state of Nature, in other words change is happening all the time: constantly! Mother Nature is about cycles. Rooted on the Greek word kyklos = wheel, circle, cycle means a recurring series of events or the interval of time is takes for a sequence of recurring events to complete. Day and night, the seasons, the orbit of the Moon around the Earth, the orbit of the Earth around the Sun, the rotation of electrons around the nucleus of an atom, the oscillation of a crystal, an alternating electrical current, the tilting of the axis of the Earth, changes in the eccentricity of the orbit of the Earth around the Sun, the water cycle of precipitation, evaporation and precipitation etc. these are just a few examples of naturally occurring cycles. What is important about natural cycles is that because of them the Earth has oscillated between cold (glacial) and warm (interglacial) ages. It is because of these cycles that climate changes; these cycles cause the annual Atlantic hurricane season. These are natural processes that will continue to occur, but which are not immune from the effects of human activity. In this regard there is overwhelming evidence that urban development is capable of changing the water cycle and local climate through the effect of what is known as the urban heat island. Human activity has also affected natural cycles through deforestation and industrial pollution. Current scientific consensus is that human activity has altered the rate of global warming, which in turn has accelerated the rate at which global sea level is rising. In this regard the most important questions, for which there is no definitive answer yet, is: is human activity capable of totally disrupting some of these natural cycles? Mother Nature is about balance. I am talking about searching for balance, a point of equilibrium if you will, between extremes. Such constant search for balance is evident in the movement of the tectonic plates. When adjacent plates moving past or against one another lock along fault lines, strain builds up reaching extremes, until Nature uses a break generating earthquakes, allowing the accumulated strain to dissipate as shock waves that shake the ground as they propagate radially away from the epicenter. The atmosphere is also a good example of how Nature seeks balance between extremes. Storms and hurricanes are generated when extremes of heat and pressure create contrasting extremes between regions, and Nature seeks a balance by the transfer of heat from the tropics to the cooler latitudes. Mother Nature is about paradoxes. Consider the following: what could be more essential to human life than air and water? In the case of air we do not even see it, but without it we die. We can say the same thing about water, for our organism consist mainly of water and while human beings may go lengthy periods of time without solid food, they do not survive for very long when deprived of water. In contrast with this absolutely critical and essential human need for air and water, consider that air and water are the two most damaging components of hurricanes. Wind, which is air in movement, rushes and extreme speeds generating wind-velocity pressure that is applied to buildings and other objects in its path. 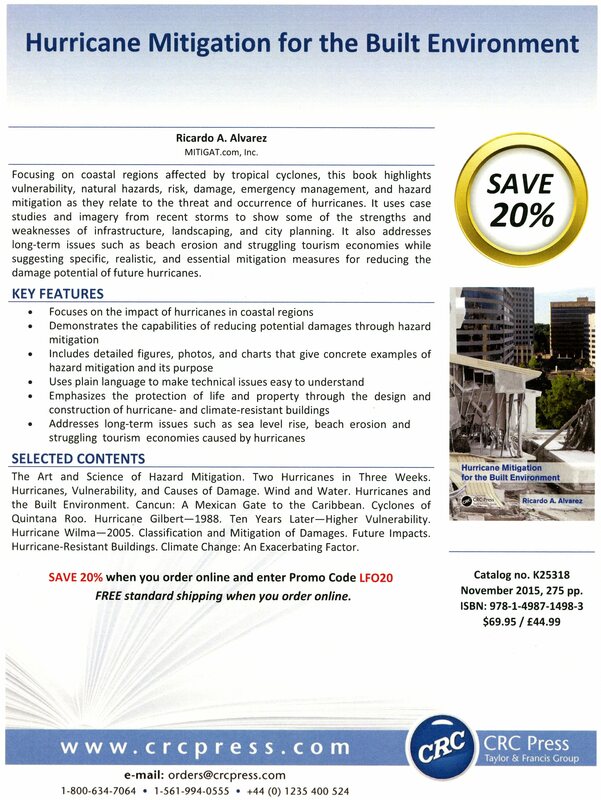 The forces applied to buildings as hurricane winds apply pressure can cause catastrophic damage that may result in structural failure of a building. Storm surge generated by hurricanes causes water to rush overland, while the wind generates waves above the rushing water, impacting buildings and objects in its path. Hydrodynamic pressure applied by the rushing waters of storm surge and breaking wave impacts are powerful enough to cause catastrophic structural damage to buildings in coastal locations. What a paradox this is, that two elements that are so delicate and so essentially needed can be so damaging to human life and human activity. Perhaps this is a case of too much of a good thing can be bad? Behold the Earth’s atmosphere, such a tenuous veil of gases surrounding our planet. If it weren’t for the clouds and the colors of sunsets and sunrises, we wouldn’t even know it is there all around us. But it is within this atmosphere that, that an even thinner band of gases and water, the biosphere, exists allowing human life to exist unassisted. Consider that while Nitrogen and Oxygen make up more than 99% of the atmosphere other components of the atmosphere, including greenhouse gases carbon dioxide and methane, which add-up to barely 3/100 of 1% of the total volume are the ones that create the conditions of temperature and protection from harmful solar radiation, that allows human life to exist. We are talking about such an infinitesimal portion of such a flimsy veil of gases that makes all the difference in the world as far as human life is concerned. What is more remarkable. speaking of paradoxes is that human activity and its byproducts of greenhouse gas emissions and atmospheric pollution are causing severe, perhaps irreversible, adverse consequences on the very atmosphere that protects us nourishes us. Food for thought. Let us respect and strive to understand Nature, let us live in harmony with Nature. Let us mitigate the human impact on Nature’s cycles. Let us not interfere with natural processes lest humankind becomes one of those extremes that Nature tries to quell.